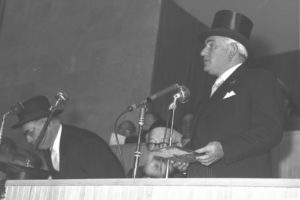 Sir Isaac Wolfson Speaking at the Dedication Ceremony of the "Heichal Shlomo" Chief Rabbinate Building in Jerusalem. To his right, Chief Rabbi Yitzhak HaLevi Herzog and Dr Moshe Avrohom Yaffe. The Jerusalem Great Synagogue was born when a plot of land next to Heichal Shlomo building in Jerusalem was purchased with the efforts of Dr Maurice A. Jaffe, chairman of the Board of Management of Heichal Shlomo. 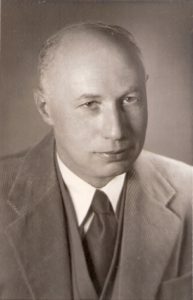 The main sponsor for construction of the new synagogue was Sir Isaac Wolfson, a Jewish philanthropist from Great Britain. 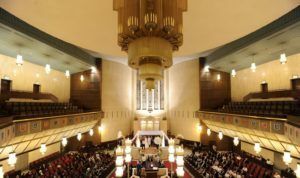 The Wolfson family consecrated the synagogue in the memory of the six million Jews who perished in the Holocaust and to the fallen soldiers of Israel Defense Forces. Designed by German-born architect Dr. Alexander Friedman, the new facility inauguration took place on 4 August (Tu B'Av), 1982. The style of the building is inspired by the ancient Temple. The Main Sanctuary with its resplendent architectural features and unobstructed views from any position, seats 1,400 and is acoustically engineered to maximize sound capacity. Viewing the Bima (main prayer stand) and the area leading to the Aron Kodesh (Torah repository) one sees the shape of a splendid Menorah (candelabra). 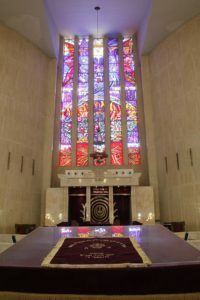 Above the Aron Kodesh are breathtaking stained-glass windows, crafted by Régine Heim-Freudenreich of Switzerland, portraying elements of both the spiritual and physical realms. Highlighting the main sanctuary is a dazzling chandelier weighing over three tons. Every seat has an unobstructed view of the sanctuary. The stained-glass windows on the sides of the men's and women's sections, were created by Alexander Friedman and depict themes of Shabbat, holidays and Biblical events.